It’s egalitarian, it’s informal, and a fantastic place for any budding player like me to soak up some wisdom from a few seasoned players… and maybe even help a few fellow players out. A few weeks ago, for instance, I taught a guy how to bend his notes. It’s the gift that keeps on giving. So last week was the London Harmonica’s year-end performance. After weeks and months of meeting and jamming in the secretive little cellar beneath the Torriano Pub, we finally stepped into the public eye, above ground in the Old Red Lion pub in Islington. Half the pub was amateur harpers and their spouses and partners, and the other half was disinterested punters who came for a quiet pint and fell victim to our musical ambush. We did a few ensemble numbers: an arrangement of ‘Soweto’, written by my compatriot Abdul Ibrahim, a botched attempted at ‘Mercy Mercy Mercy’ by Cannonball Adderley, and the Flintstones theme tune. There was something undeniably cartoonish about the whole thing: a dozen harp players of various shapes and sizes squeezed behind not-nearly-enough sound equipment, each playing a slightly different tune to the others. It was the open mic equivalent of a clown car. After the ensemble pieces, the stage was open for freestyle harmonica performances. On show was a succession of wonderful players such as Joff Watkins and Phil Leiwy, but featuring a few of us bottom-dwellers too. Sure, there were some cringeworthy moments – particularly a few squawking attempts at much-loved Christmas carols. By the time I took to the stage, the non-harmonica part of the pub vacated the premises, many of them probably brandishing fresh new prejudices about harmonica and the dastardly wretches who play it. And I gotta to be honest; I don’t blame ‘em. … But if I sound disapproving, I ain’t. True to the spirit of the collective, nobody was forced to play if they weren’t feeling up to it, and equally anyone was welcome to join in. Who am I to gripe about the sound equipment? It was a free concert, organised by a bunch of guys who could be off doing better things. The truth is, it’s a trade-off. Yeah, we sucked pretty badly, but that’s how we learn, dammit. This is how the secrets of the trade get passed on. 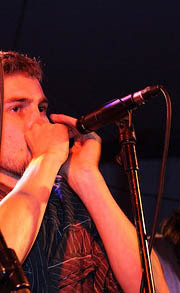 This is the future of harmonica-playing in England’s capital city. London Harmonicas provides a place where anyone can learn to blow harp, and they get a chance to be heard. They get a chance to squawk, to play a few bum notes, to make the mic shriek its feedback. It’ll piss off the punters, without a doubt, but you gotta do that if you’re training up an army of bitching harp players. In a few years, we novices in London Harmonicas won’t be squawking Christmas carols any more, we’ll be playing sweet and low. Elwood is running the Harp Surgery’s Apprenticeship blog. Check the London Harmonicas for details of upcoming meetings. And hey, if you feel like playing a Christmas Carol, check Wilf’s recent post. Also, I gotta give a shout out to the guy who loaned me his spare C harp for the evening. Mine’s in Berlin. Thanks, man.